The degree symbol can be used in geometry or in determining geographical coordinates. This special symbol can be inserted. There are a few different ways you can achieve this. Read on to find how. The easiest, but not necessarily the fastest way to insert a symbol is by using the Symbol button. You can find it under the INSERT >> Symbols >> Symbol. Click the icon to open the Symbol window. Scroll down to find the degree symbol. At the bottom of the page, you can find a character code of a symbol. If you remember this code you can insert symbols much faster than searching it in the symbol window. Each special symbol that you can insert has its own unique number by which it can be identified. You can enter it by holding Left Alt, entering the identification number from the numeric keyboard and then releasing the Alt button. If the symbol doesn’t appear, check whether the Num Lock button is on. 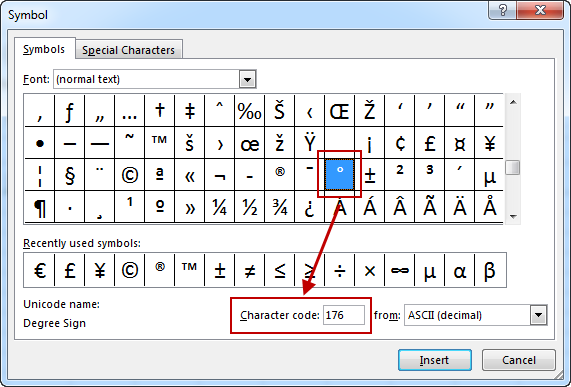 In Windows, you have two methods to insert the degree symbol entering the code. Click the cell where you want to enter the symbol and use one of the two options. From the DOS code page – Left Alt + 248. From the Windows-1250 code page – Left Alt + 0176. When you release the Alt key, the degree symbol will be inserted in the cell. More about this topic you can read under this link. The last method is similar to the first one, with the difference that you could use the first method only inside the Office Suite applications. This one can be used in any Windows program. In Windows 7, you can find the Character Map in Start >> All Programs >> Accessories >> System Tools >> Character Map. Choose the character, click select and then copy. Now, you can the symbol anywhere you want, not only in Microsoft applications. 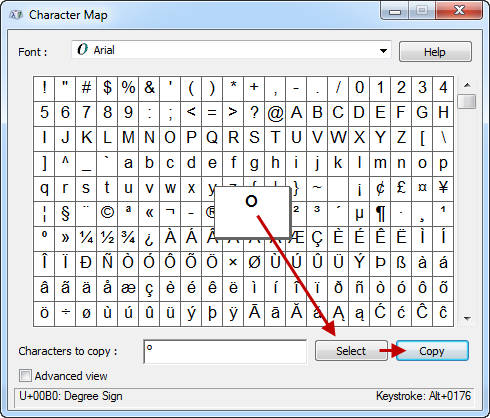 You can copy multiple symbols at once.